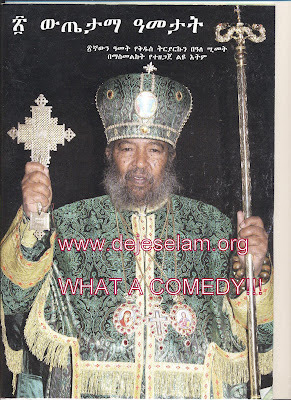 ደጀ ሰላም Deje Selam: What a Comedy!!! 20 አመታት የቤተክርስቲያን የፈተናና የወደኋላ ጉዞ ዘመናት! ሰው ግን እስከመቼ ነው ለሆዱ የሚኖረው? እውነት ከልባቸው ነው ግን "20 ውጤታማ አመታት" ብለው የጻፋት? Betam Tigermalachiw Simsilachiw Tidegifalachiw Sayomeslachiw Degimo Tlawomalachiw Min Yihon Alamachiw???? wesha abate nachewe!! !menafeqe nachewe betekirstiyane laye yeqeledu(bemenegest teshomewe betekirstiyanene yemenafeqan mefencha yaderegu)betekirstiyanene yawaredu...meseluachewe newe ferdune ke geta yagegnutal!!!! Aba Paulos weyis Aba diablos libel Yasazinal rasachewn kebetekristian belay habt yakabetubet wutema Adrguachewal! It's well known that Abune Paulos is an EPRDF cadre. He has been known to have stated that as long as Melles is alive, he will have no worries. Now it's public knowledge that Melles is on the verge of dying. 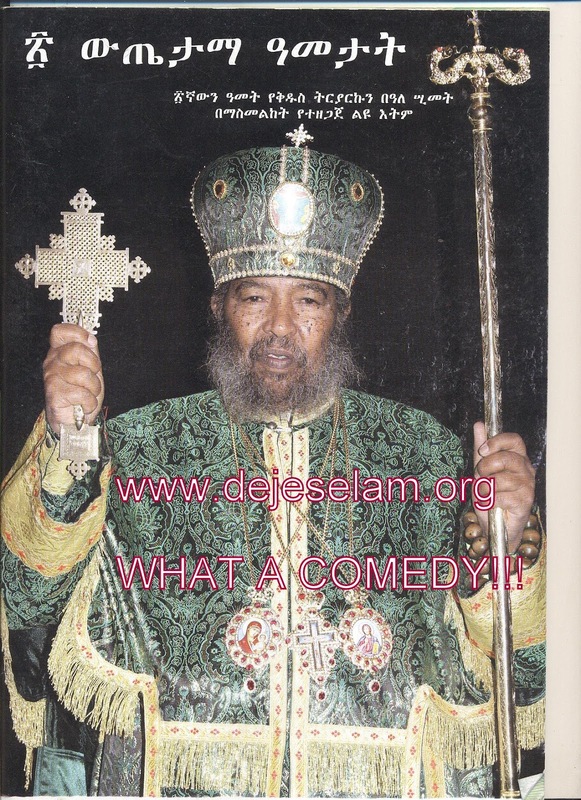 Abune Paulos is also not rather old but suffering from various ailments. Could someone advise him to think more about his soul instead of only worldly goods. He could earn a lasting favourable legacy if he were to use his remaining short life for the church's peace, love, development, and recociliation. 20 years of pain, 20 years of sufferings, almost the same period of time , like "mesagu in the bible, who was in the bed for 38 years". I am not telling prophesy, but time is short for those who makes senior, elders, kids, Adults, cry. GOD is listening to the needy. whoever in power should listen the warning. Death is knocking on each door! Amen! 1 abune Basilyos Min Seru ? 2 Abune Tewofilos Min Seru ? 3 abune Takile hay Min Seru ? 4 Abune Merkorewos min seru ? 5 Abune Pawlos Min seru ? we are counting the days to come. his lay should be halted and he should pay for he is doing to our church!!!! Dear DS, Betam new yemitasazinu lekas chifine tekewami nachihu What a comedy tebilo zimbilo ayiwetam endebesele sew metsihafun anbibachihu dikimana tenkara gonachew menager litasinebubun sigeba bichifin yemetsihafu coveru bicha letifachihu "what a comedy ?" maletachihu enante ga yeneberegn amelekaket endikeyer adirigolignal. Enebigile yemikawemachew bizu tifat yeseru endale Aba Paualos Awukalehu lemisale "Ti'ebit alachew, Akiburugn bay nachew", haweltu lifers yigeba neber... neger gin degmo melkamim yeserut ale lemisale yekidist silase menfesawi college, ye Anune fireminatos menfesawi colleg enditenakeru adirigewal. Bederg gize yetewesedu yebetekiristiyan yizotawoch endimelesu adrigewal. Mechem 20 amet mulu minim alserum endematulign tesfa adergalehu. yihinin eyetawek gin chifin mekawem lebetekiristiyanachinim lehagerachininm ayitekimim. Egzaibher mastewalu fikiru yadilen. I don't want to say anything, but "EGZIABHEREN atferume"
In these 20 years created more than 20 problems. Yes it is 20 years success to lower the real Orthodox, ruin the strong pillars of the church, mix-up the church with ethnicity politics and the highest and the best corrupted center and so on! Sorry,I don't get the comedy where is it? For Him and his corrupted groups it is a success. ABETU AMELAKACHINE AHUNEMI BEKACHIHU BELENE! AMEN! እንኳን ለመጀመሪያና ለመጨረሽያ አመት አደረሳቸው:: እኔ ምንም ያልሆንኩ ተራ የኢትዩጵያ ኦርተዶክስ ቤተ ክርስትያን ተከታይ ምእመን ነኝ:: ይህን ድህረ ገጽ ለምትከታተሉ በሙሉ በቅድምያ ሰላመ እግዚአብሄር በሁላችን እንዲሆን እመኛለሁ:: መልዕክት አለኝ እኔህ ለ20 ዓመት የመሩን አባት የአመራር ግዚያቸው አልቋል:: አይሞቱም ᎒ግን በሄወት እያሉ ሰደትን ᎒ ውርደትን ᎒ ቅለትን ᎒ ይከናነባሉ:: መሳደብ አይሁንብኛና ሀቁ የውሻ ያህል ክብር የማያገኙበት ዘመን ይኸው መጥቶል:: እሳቸው እንዲህ ሲያጋጥማቸው በተቃራኔው ግን አሁን ለሀይማኖት᎒ለሀቅ᎒ ለኢትዩጵያ ኦርቶዶክስ በተክርስትያን የሚታገል ያለ ሁሉ በከተማና በዱር በገደል ያለው በሙሉ እንደ አዲስ ይጨበጭባል :: በአጭሩ እመኑኝ ምእመናን ወጉኖቸ ፀሐይና ᎒ ጨረቃ ᎒ በአዲስ አጢቤያ ይታያሉ:: ይህ ዓመት የማይሞላው እውነታ ነው:: እባካችሁ በየቤታችሁ ሁናችሁ በጾሎት ኢትዩጵያን አስቡዋት:: በተለይ የማህበረ ቅዱሳን ቤተሰብ የሆናችሁ በሙሉ ጾለትን በተመለከተና ያልሰማ በማሰማት ትልቅ አደራ አለባችሁ:: በበኩሌ የራሲን ድርሻ በጾሎትና በአቅራቤያየ ለሜገኙ ለበተክርስትያን አባት ሆነ አባላት ለመናገር ቆርጨ ተነስቻለሁ :: የድንግል ማርያም ልጅ ይርዳኝ:: አሜን!